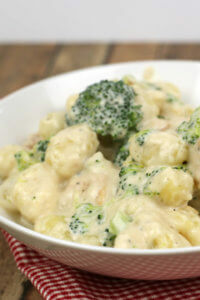 Steam the broccoli in the same pot as the gnocchi, while it's cooking. Meanwhile, melt butter in a large saute pan over medium-low heat. Add garlic and saute for one minute, or until fragrant. Stir in flour for one minute. Let the sauce thicken over medium-low heat, whisking periodically for about 5-10 minutes. Once sauce is thickened, add Parmesan cheese and stir until combined. Add the cooked gnocchi and broccoli and stir until combined. Top with extra grated Parmesan.